James Bosley, a freelance senior print and textile designer who currently works with Louis Vuitton, Pucci, and Maison Margiela lives with his boyfriend, Daniel Gayle, who is Head Of Collections at Victoria, Victoria Beckham, having established the Victoria Beckham sister line five years ago. They live together in Nunhead, SE15. How long have you lived in your Nunhead home for? We have lived in our current flat for almost two years. However, I (Daniel) was brought up in Nunhead, just around the corner on Nunhead Grove, so really I have been here forever! James was always a South East Londoner, having moved here to study Textiles at Goldsmiths. He was in New Cross until a small blip took him to Mile End for a few years but we managed to get him back South when we moved in together. Do you know a little bit about the history of the flat? Before and during the process of buying the flat we tried to find out as much about the history as possible. However, information was hard to come by. What we did manage to discover was that the flats were built in 1960-61 and word has it they were conceived to house railway workers and their families at the time. One thing that is really striking is the sense of light and space in the flat, even though the rooms are not overly generous, how did you go about achieving this? We had lived in a variety of different flats/houses before that were either terrible conversions with no room or light or huge town houses (during flat shares) so we had a real understanding of how to get a balance of space (we have a lot of stuff!) and light. When we viewed the property the first thing we noticed was the design of the hallway, how it almost felt like a room itself, as it is quite wide. We wanted to make sure we kept that feeling of space so that you could move from room to room easily. This informed the choice of the glass panelled doors and the parquet floor. The idea behind the floor was that it would seamlessly connect the hallway to the living room and bedroom, again, giving the feeling of a long space as opposed to truncated sections fighting for attention. You both work in fashion design, do you think this changed/affected how you approached designing your home? Without a doubt – we both brought a certain ‘design’ approach to the project. James really had the most innovative ideas, but still managing to throw in a historical reference. He has some fantastic books that we were able to use as a guide, in particular a Terrence Conran edition from the 70’s. 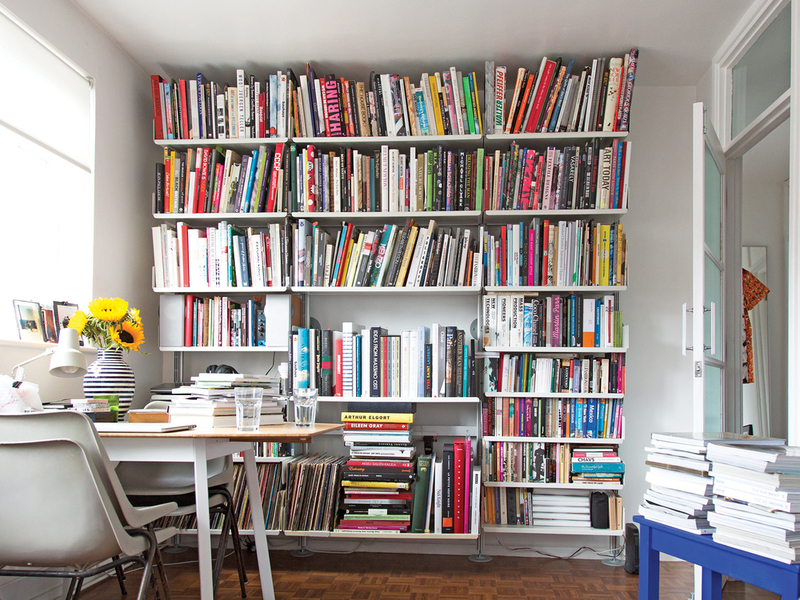 Also, it was James that pushed for the Vitsoe shelving, not only because of its great design and practicality but because it really is a product born of the same era of this flat. I think what I brought was more of the design-through-problem-solving! For example, I take full credit (James would disagree!) for the built-in wardrobe. In an attempt to keep the bedroom space as open and clean as possible but still have room for all our clothes, I thought it would be quite clever if we built into the small alcove in the corner of the room. With the help of my Dad, who is a fantastic carpenter, and an IKEA shelving system we made a bespoke wardrobe space the can be hidden behind the floor-to-ceiling door! The beautiful doors and flooring feel very much intrinsic to the flat, are they original? Unfortunately not. The doors were the first things we wanted to change when we moved in. When we had viewed the flat we noticed that when all the doors were opened in the hallway, the light from both sides of the building (there are windows at the front and back) flooded into the hallway but of course as soon as they were shut it was in darkness. Then one day, before we officially moved in, we noticed the door to flat one was open, so popped our heads in to introduced ourselves. Michael, who has lived there for forty odd years now, has the flat in its original state… with readed glass panel internal doors; we were convinced that this was the only door that would do. We set about trying to salvage old doors that we could re-hang but to no avail so we eventually decided to invest and have the doors made from scratch, even in the bathroom, although there is a blind on the back of that door for a little privacy. The floor was actually something James and I had dreamed of for as long as we’d been together. Having had some bad experiences with carpets in our previous flat-shares we promised ourselves this would be the one thing that we wouldn’t compromise on! It is increasingly a requirement for our homes to be live/work spaces, how did you manage to create a productive working space? This one was relatively easy for us. 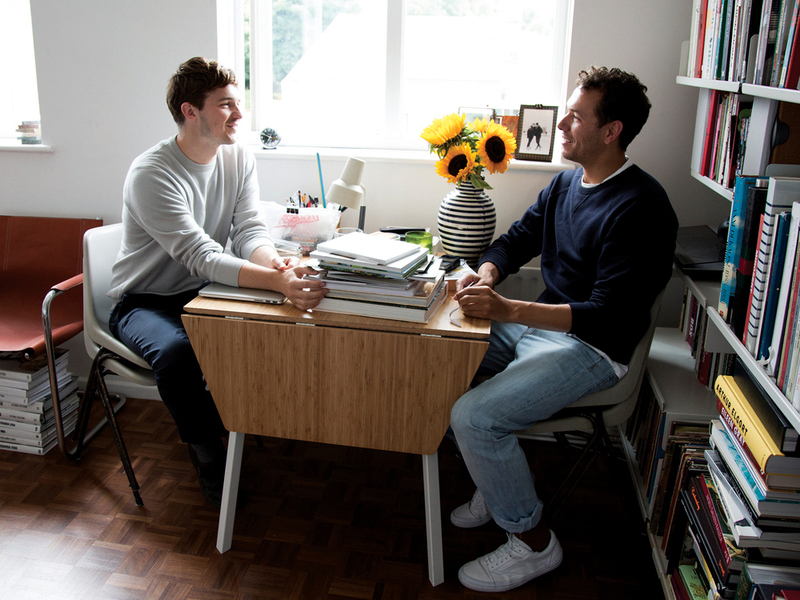 I work from the studio in Battersea but James has always worked from home, previously from a desk in his bedroom and then from a desk in the living room of our old flat. Here, the second bedroom immediately became the office. We took the floor back to its bare concrete and coated it in a latex-screed finish in white. It’s hard to keep clean but really helps create empty (ish) space where James can research and design without fighting with other elements. Also, James was insistent on keeping the 1940’s armchair in the office so he had a place to ‘break’ from his computer. It’s his favourite thing! What are your local tips and favourites? Having grown up in the area I’ve seen many changes but the one thing that hasn’t changed is Ayres bakers. My mum used to get cakes from here as a child and my brothers and I all did when we were kids. My little sister even worked there for a summer! They do the best bread pudding, they also still do the bright green iced frog cakes that we had as kids! F.C Sopers on Nunhead Lane is brilliant for fresh seafood, although mum has moved out of the area we still order her Christmas dinner bits from there. There a few good pubs in the area but our favourite is The Earl of Derby. Its small, quiet and has a great domed bar front. Also, the Ivydale is great; it’s a co-operative with some really good beer and ale. Has a great little dance hall out the back too!